This is the standard markup used to create web pages. A web browsers job is to take the HTML documents given to them and display them into usable pages. 2000: XHTML 1.0 was introduced – An XML-compliant version of HTML. Tasked to extend the meaningful life of HTML. 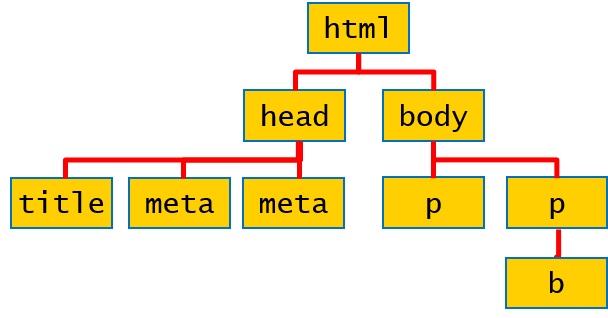 2007: HTML5 concept launched – W3C and WHATWG formed a working group to develop the HTML5 specification. Plus lots of other nice things! HTML5 brings in simplifications to its declarations – these are required by the browser or application to understand correctly what you have wrote. Set the style attribute directly on an HTML element. E.g. define styles that apply to tag names. E.g. define styles that apply to tags of a certain class. For the lab work of this part of the course we are going to be looking at a previously made project and using the examples you have learnt, understanding how and why it works. Firstly familiarizing ourself with the project. The web page allows the user to suggest new products that a company might add to its product range. The user can enter a description of the product, their email address, a recommended retail price for the new product, and an estimate of the number of units that might be sold in a year. When the user clicks Add, the Web page adds the product suggestion details (as a formatted string) to an array behind the scenes. The contents of the array are displayed in the All product suggestions panel in the lower-left of the Web page. The user can also sort and reverse the array, via the Sort and Reverse buttons. 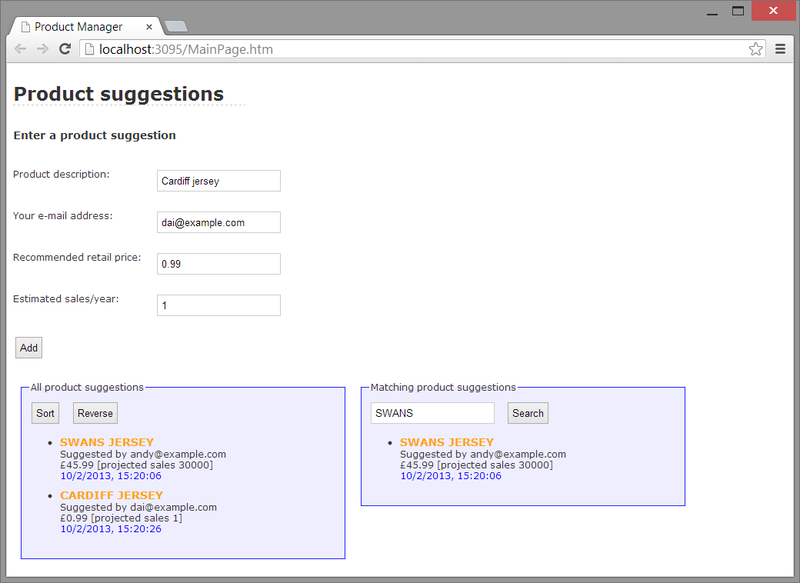 On the lower-right of the Web page, the Matching product suggestions panel allows the user to search for products that match a regular expression pattern entered by the user. The matching records are displayed as a list in that panel. The <head> includes a script file named ProductSuggestionsFunctions.js. Take a look at this script file. The script file contains various functions that we’ll explain during this lab. When the user clicks the Add button, it causes the doAdd() function to be called. This function returns false, to prevent the form from submitting itself to the Web server. The first <fieldset> element displays all the product suggestions (the product suggestions will actually be displayed in the <span> whose id is allProductsList). The <fieldset> also contains Sort and Reverse buttons, which invoke the doSort() and doReverse() functions respectively. 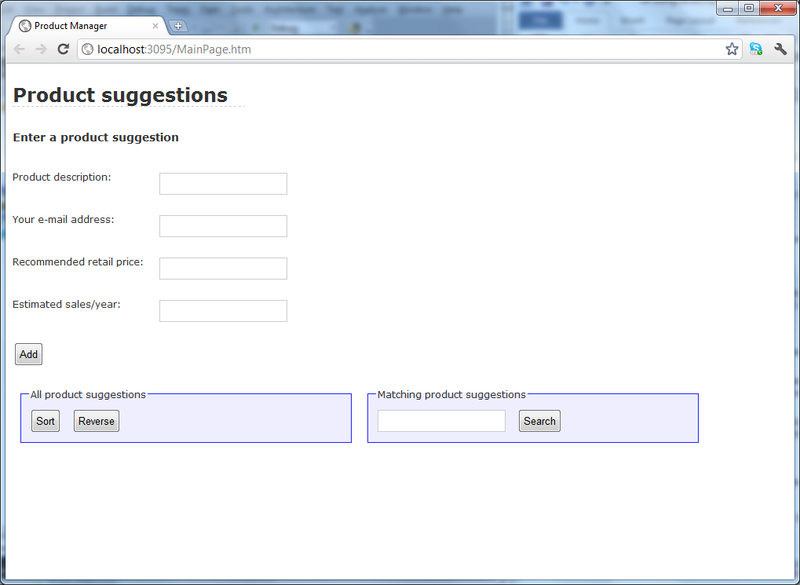 The second <fieldset> element allows the user to search for product suggestions that match a regular expression. The results will be displayed in the <span> whose id is matchingProductsList. Provides access to all the HTML elements in the current page. Represents a <form> element in the current page. Has an elements property, containing all HTML elements in the form. Has submit() and reset() methods. Represents a text input field. Useful properties: value, disabled, etc. And there are many more but that is just a few that are common. getElementById() – Gets the element whose id attribute has the specified value. E.g. getElementsByName() – Gets all elements whose name attribute has the specified value. E.g. getElementsByTagName() – Gets all elements with the specified tag name. E.g. Call document.createElement() to create a new element. Call cloneNode() to create a copy of an element. Call insertBefore() to insert a node before the current node. Call appendChild() to append a child node to the current node. Call removeChild() to remove a child from the current node. Call replaceChild() to replace a child with a different node. Use innerHTML to get or set the inner HTML of an element. Use outerHTML to get or set the outer HTML of an element. Shows how to set the focus to an element when the page loads. Shows how to access elements in a form. Shows how to manipulate radio buttons in a form. Shows how to manipulate a drop-down list in a form. Working with strings and dates – Open the ProductSuggestionsFunctions.js script file from ProductManager.sln. Note that it kicks off by defining a global variable named allProducts this is an empty array. Now locate the doAdd() function. The purpose of this function is to get the values entered by the user in all the text boxes, build a formatted string, and then add it to an array. The email field is retrieved as a simple string. var product = description.toUpperCase().big().bold().fontcolor("orange") + "<br/>"
+ "Suggested by " + email + "<br/>"
We use the toUpperCase() function on the standard String object to convert the product description to uppercase. We use the big(), bold(), and fontcolor() functions on the String object to add HTML formatting to the string (i.e. to set the font size, font weight, and font colour). Next we append the current timestamp to the string, by using functions on the standard Date object. We get the current date and time, simply by creating a new Date object. We use various Date functions to get the date (i.e. day), month, full year, hours, minutes, and seconds. We use the pad() helper function (at the bottom of the script file) to ensure that 2-digit time fields (hours, minutes, seconds) are displayed with a leading zero if necessary. Offers a simpler (and more logical) way to locate elements. Avoids the need for nasty looping through DOM elements. You can find elements based on nesting – E.g. “find all <h1> inside a <header>”. You can also test for pseudo-classes – E.g. “find checkboxes that are checked”. You can now use the following functions to find elements in an HTML document – This is a better (and faster) way to manipulate HTML content. whose style class is “required”. whose id attribute is “products”. For this exercise we will carry on with the project, you’ll examine the array-handling code, which adds each product suggestion to an array and displays the array items as a bulleted list on the Web page. The array to display. We want to display all the product suggestions, so we pass in allProducts here. The id of the target element where we want to display the array data. We pass in “allProductsList” here (this is the id of the <span> where the full product list will appear). We loop through the array, and wrap each array item in a <li> …</li>. Now locate the doSort() function. This function sorts the array and redisplays the sorted array data. Finally locate the doReverse() function. This function reverses the array and redisplays the reversed array data. Well done. You have completed the first tutorial in the HTML5 course.